(Bloomberg) -- The Hong Kong dollar touched the strongest level in six weeks, moving away from the weak end of its trading band, as a dovish Federal Reserve damped hopes for interest-rate hikes. China’s yuan also advanced. Hong Kong’s currency rallied as much as 0.06 percent to HK$7.8451 to the greenback, before paring the gain to trade 0.03 percent higher as of 11:40 a.m. local time. 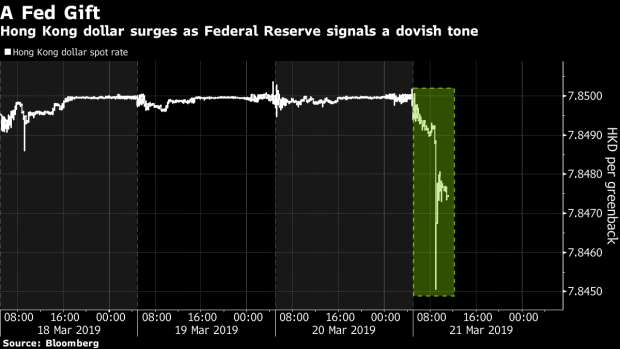 The advance came after the Fed said borrowing costs could be on hold for “some time,” triggering a slump in Treasury yields. This could help narrow the gap between the interest rates on the Hong Kong dollar and those on the greenback, easing short pressure on the local currency. The Hong Kong dollar had been stuck near the weak end of its trading band for nearly a month, as traders borrowed the currency and sold it against the higher-yielding greenback. The city’s de facto central bank has spent some $1.5 billion over the past two weeks to defend its exchange rate peg. Analysts say the authorities will have to buy more local dollars before funding costs rise fast enough to damp short positions. "Confirmation of a dovish Fed is providing some support to the Hong Kong dollar," said Frances Cheung, Westpac Banking Corp.’s head of Asia macro strategy. "The pressures on the local dollar in the spot market are reduced for now, but we cannot rule out it testing HK$7.85 again." The spread between borrowing costs on the Hong Kong dollar and the greenback is still wide, which provides an incentive for capital to flow from the former to the latter, Norman Chan, chief executive of the Hong Kong Monetary Authority, said in an emailed statement Thursday. The HKMA will keep the exchange rate stable based on its peg system, he added. The gap between one-month Hibor and the equivalent U.S. rate is around 80 basis points. Last month the spread was 158 basis points, the biggest in more than a decade. On the mainland, the yuan surged to the strongest level since July after the U.S. dollar slumped on Wednesday. That gain will be short-lived, Cheung said, as China’s currency will be pressured by the easing monetary policy of the country’s central bank and a potential narrower current account surplus. The Hong Kong dollar last traded at HK$7.8476, the strongest level since March 1. The onshore yuan climbed as much as 0.38 percent to 6.6689, before trimming gains to trade 0.20 percent stronger.